The Southfield Town Center is a cluster of five golden interconnected skyscrapers forming a contemporary 2,200,000 square feet (204,400 m), office complex which includes a Westin Hotel, restaurants, a fitness center, and a major conference center for up to 1,000 attendees. 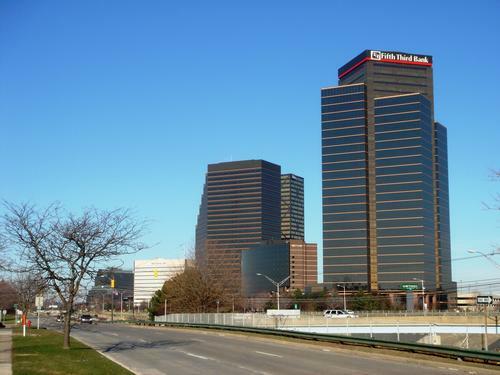 This office-hotel complex is situated along Town Center Drive off the John C. Lodge Freeway, across from Lawrence Technological University in the Metro Detroit suburb of Southfield, Michigan, with many of its tallest buildings named after their addresses along the road. Separately, there is a 33 story luxury residential high-rise at 5000 Town Center. The American Center, another 26 story golden office tower, near the confluence of I-696 and M-10, is not part of the complex. The Town Center also houses the City hall, and is located between West 10 Mile Road and Interstate 696, John C. Lodge Freeway, and Evergreen Road, as well as being close to the Mixing Bowl. An enclosed two-story garden atrium connects the hotel with the towers of the Southfield Town Center. The atrium area also contains 94,000 square feet (8,700 m) of retail space. The atrium area is available for large conferences and weddings.